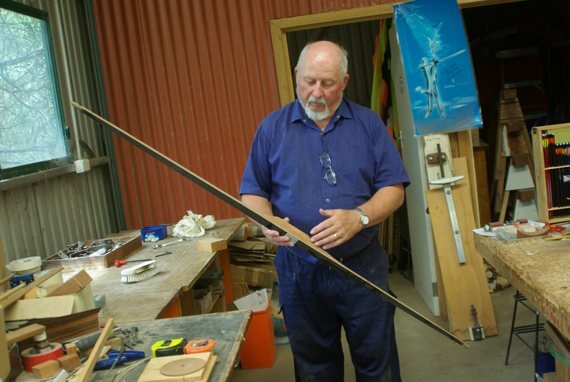 This Australian-owned business specialises in the design and manufacture of Target and Medieval-style crossbows and composite Longbows, and the supply of materials and books for those people making traditional composite bows. Ausbow Industries are custom bowyers and archery engineers. We are the Australasian agents for the EXCALIBUR range of Sporting and Target crossbows from Canada. Trade enquiries welcome. Ausbow Industries is a member of the Archery Crafters Guild and the Southern Alexandrina Business Association and supports the activities of the World Crossbow Shooting Association and Great Southern Archers (Strathalbyn Target Archers). CROSSBOWS: CONTENDER, TYRO 2 and CHALLENGER 2 competition Target crossbows, EXCALIBUR Sporting and Target crossbows and CRECY Medieval-style crossbows. CUSTOM WORK Contact John Clark to discuss any of your archery engineering requirements. Ausbow Industries has evolved from a number of hobby businesses since circa 1975. The business has been a full-time operation since early 1996 and was incorporated under Jonlyn Enterprises Pty Ltd in October 1997. The operation is run by the director - John Clark. After establishing in Melbourne, Ausbow Industries moved to Goolwa, South Australia in 1998. As we are predominantly manufacturers, it is important to make an appointment before you leave home if you wish to visit us in the historic River Port of Goolwa.